which gives its comfort and warmth to all. which blows equally upon the king and the poor beggar. Guru Har Rai Sahib Ji lived and breathed a sensitivity to all living things. Throughout his life he exemplified a compassion that ran so deep, his love and protection extended to all beings in God’s creation. Many times we are blinded by the exterior covering, so we fail to look deeper. Yet the pervasiveness of the One Spirit that exists in all beings does not discriminate. It requires perseverance to look deeper, to go beyond earthly distinctions and discover the true reality, which may be concealed, but is absolutely real. Seeing beyond the obvious is often a challenge, but it is our obligation as the Guru’s Sikhs. 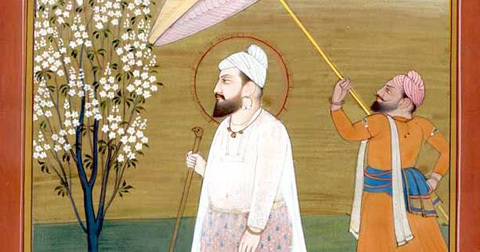 There is one story in particular that illustrates Guru Har Rai Ji’s depth of compassion. This comes from a Suraj Prakash, which refers to very old stories of the Gurus, as handed down from the families who were alive during the times of our Gurus. I have always been intrigued by this Suraj Prakash, which tells of Guru Har Rai Ji and a wounded snake that he encountered, while walking in the company of his Sikhs. Snakes are considered the lowliest of God’s creatures, crawling only on their belly, near the ground. They are so often associated with trickery and deceit. The response most of us have when we see a snake is to retreat or possibly to kill it. Yet in this story of the snake who had the great good fortune to meet Guru Har Rai Ji and his Sikhs, we see a different scenario unfold. 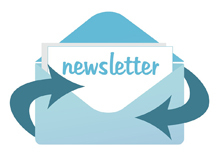 We may also have the opportunity to learn something about the judgments we make, based only on surface facts. As Guru Har Rai Ji was walking with his Sikhs, their eyes fell upon a wounded snake that was crawling toward them with considerable difficulty. The snake was clearly near the end of its life; it was being tortured by worms, which it tried to shake off by wriggling and shaking its body. 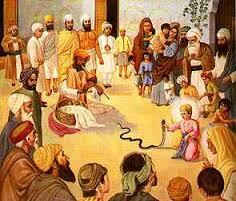 Guru Har Rai Ji in his mercy granted the wounded snake its salvation in eternity and liberated its soul from pain forever. As the Guru’s disciples watched him with the snake, they saw a powerful, bright light issue from its body and soar upward to the heavens. The Guru’s Sikhs begged him to explain what had happened, and how it was that a light so bright and powerful resided inside the body of such a wretched creature. The pandit did not know that Guru Nanak Dev Ji’s compositions were the pure, true Light of God. He failed to listen to the Divine wisdom, which would have lifted him out of his quagmire. In his heart he knew that the Vedas could not help him, but he rejected his only chance to know true reality because the dialect was unfamiliar to him. He chose not to look beneath the surface. At the end of his life, the pandit’s soul passed into this serpent, and ever since the worms had been causing him to suffer, because of the deceit he had practiced on people. By association with the saints, one has no pain or struggle. There is no necessity to toil in their company. On beholding and meeting them a person becomes happy. if he has no love for God. Rely only on the True One who resides within all. 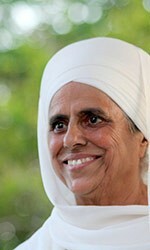 Bibiji Inderjit Kaur Khalsa, PhD, serves as Bhai Sahiba or Chief Religious Minister of Sikh Dharma. She is the wife of the Siri Singh Sahib Bhai Sahib Harbhajan Singh Khalsa Yogiji. As Bhai Sahiba she is responsible to advise Sikh Dharma on religious matters and promote good relations with the global community. Bibiji has authored books on Sikh educational principals, including Living Reality, and the Siri Guru Granth Sahib Blessing, an intricate and esoteric description of the rags (musical scales), poetry, and architectural design of the Siri Guru Granth Sahib, the sacred body of Sikh scripture, hymns, and holy verse.